A potency of 200C is recommended. Dosing should be done daily for 3-4 weeks. It actually fixes the tear (this can be confirmed in follow up X-rays) and in cases where it is used, surgery can be avoided. Once the tear is healed the dosing should be stopped. 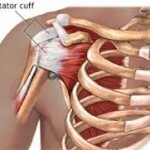 This remedy is ideally suited for RIGHT sided rotator cuff tears. Will also work on left sided injuries. Pain in upper limbs, shoulders. For deep aching pain of tendons and ligaments. Used also in tennis elbow. Used in carpal tunnel syndrome with overuse injuries of people who use their wrists excessively. Used for eyestrain and ganglion cysts.